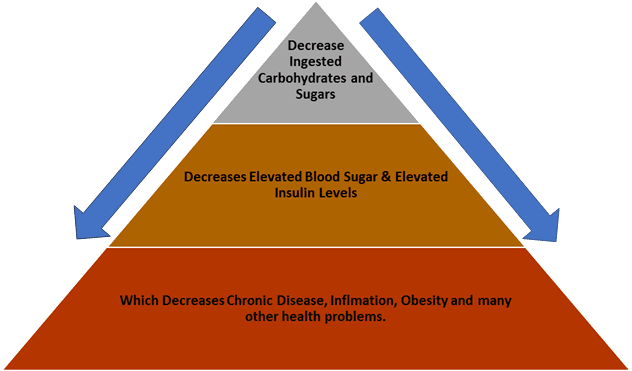 Diabetes mellitus (DM), commonly referred to as diabetes, is a metabolic disorder in which there are high blood sugar/glucose levels over an extended period. Blood sugar, or serum glucose, is the main sugar found in your blood. It comes from the food you eat and is an energy source for your body. Blood sugar can be either low, normal or high. Many functional medicine clinics take the view that a fasting blood sugar level of 75-80 is optimal. Hypoglycemia (low blood sugar) can be mild, moderate, or severe. The human brain requires ½ of all the normal circulating blood sugar (glucose) to function normally. Because the brain requires a large amount of circulating sugar to function correctly and we don’t always have access to food 24 hours a day, we can maintain blood sugar levels through other pathways. If blood sugar levels start to fall, the i releases glucagon which stimulates the liver to convert stored glycogen into serum glucose. When glucose is released into the bloodstream, the pancreas secretes insulin to drive the newly formed serum glucose into the blood cells to be used as energy. Another factor that influences blood sugar is cortisol. If serum glucose falls to a low level, the adrenal glands secrete cortisol. Cortisol works by tapping into the protein stores via muscle breakdown. The protein broken down from the muscles undergoes gluconeogenesis, which in turns raises the blood sugar levels. Blood sugar levels above 100 are toxic to many functions of the body. As blood sugar levels increase, so do Advanced Glycation End Products (AGE). AGE are proteins or lipids that become glycated because of exposure to sugars. They can be a factor in aging and in the development or worsening of many inflammatory and degenerative disease, such as diabetes, atherosclerosis, chronic kidney disease, and Alzheimer’s disease. The Brain, Liver, Muscles, and Body Fat are the 4 main matters that utilize or store glucose. The goal of diabetes treatment is to decrease the amount of insulin or other medication needed. Many clinicians think that perfect management of diabetes equals adding additional medications until laboratory numbers look better. This does little to reverse or improve the underlying disease process. The only way to improve diabetes is to decrease the need for insulin and medications.